NASHUA—Rita I. (Roy) Levesque, passed on to our Lord on November 18th 2018 at the age of 81. She died at the Community Hospice House in Merrimack NH following a brief diagnosis of Cancer. She was the beloved wife of Romeo Levesque, with whom she shared 55 years of marriage. Born on Dec 26 1936, Rita was the Daughter of Phillip Roy and Irene (Lambert) Roy. 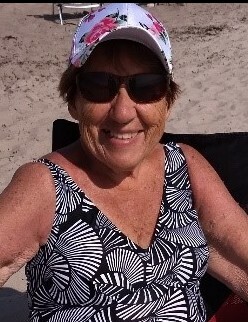 She Graduated from The Saint Vincent Hospital School of Nursing on August 30th 1959, and following worked at St Joseph’s Hospital Nashua NH for 15 years. Rita was Staff Nurse, quickly working her way to Head Nurse, then finally House Supervisor. After her time at St. Joseph’s, she bought and operated a Children’s Daycare for 8yrs. In 1978 she graduated from N.E. College with a BA in Psychology and Sociology. While Still Managing the Daycare, Rita returned to Nursing Working in various Nursing homes as Charge Nurse, Supervisor, Assistant Director, and as a Consultant. Finally, the last 15 years Rita worked Coordinating and teaching CAN/HHA Certified program in Lowell. She finally retired in December of 2008. Rita was a member of the “RED HATS”, a member of the Lady’s Guild and a communicant of St John’s Church in Hudson. Rita loved to read, travel, go antiquing, and play dominoes. Above all else though, Rita loved spending time at the beach with her beloved husband. Besides her loving husband, she leaves behind three children: Karen Barrows and her husband James Barrows, Lynn Hilbrunner and her husband Kevin; her son James Levesque; her three grandchildren, Jenna Barrows, Brennan Barrows and Kaitlyn Hilbrunner. Rita also leaves behind a Cousin-Friend-“Brother” Emery Nadeau and many other relatives, whose lives she deeply touched. Family and friends are welcome to call at the ANCTIL-ROCHETTE AND SON FUNERAL HOME, 21 Kinsley St., Nashua on FRIDAY, November 23 from 5 until 7 p.m. Rita’s Funeral Mass will be held at St. John the Evangelist Church, Blessed John XXIII Parish, on SATURDAY at 10:30 a.m. At the request of the family, burial will take place at a later date. As an expression of sympathy, donations may be made in Rita’s honor to Winnipesaukee Warriors c/o Special Olympics, 650 Elm St., Manchester, NH 03103 or to Community Hospice House, 210 Naticook Rd., Merrimack, NH 03054.